Wider strakes, but less strakes than he had on the MSV bottom. No Kevlar, but a light layup all iin glass and wood. Three man crew and a deck design that would mimic the looks of the 24 Banana boats that we had produced. It was one delay after another all during the winter and then the Spring of 1978 until we got to the point I had already missed three races. It looked like the earliest I could take delivery of my boat would be late spring or early summer. I had a new Cabover sleeper MACK tractor and purchased a new trailer custom built for the boat by Target Trailer. The boat was going to be rigged by Bobby Davis at his shop B&C Marine in south Florida. B&C was directly across the street from Elswick's race shop and right up the street from Knocky House's prop shop. So the day finally arrived and we were going to test the boat in Ft Lauderdale. I had Custom Engine build me two new engines, with Kinsler fuel injection stacks on them. I used Merc number three drives and the boat was set up with a staggered set-up. Hatches were not finished so we ran the boat with no hatches. Slim, one of Bobby's riggers, David Irwin who was Stan Irwin's son from Custom Engine and me. Out of the inlet we go and run right into head seas and the boat is doing exactly what I was hoping for. With my Cigarette, the bow would ride on the face of the wave and lift off and fly. With a very narrow bow on this boat I wanted the boat to cut through the face of the wave and stay down, until the weight of the boat helped to keep it in the wave rather than climb. It worked perfectly. The boat was good on cross seas and following seas. So was I grinning from ear to ear? Nope the boat was a slug. Low to mid 70's was the best speed we could get out of it. Changed props and saw a slight improvement, but it looked like I built myself a.... pretty looking also ran, Open Class monster. It had a been a long time getting to where we were at that point, so I just wanted to wrap it up and take it home to Rhode Island. Don Aronow gave me a set of race hatches that we modified to fit and put them on. Then I had my driver bring the boat north. It got as far as Maryland before there was a problem with the trailer. So I send another truck down with another trailer from Rhode Island and load the boat on that trailer and bring it home. Target Trailer authorized the repairs needed and we had the new trailer back within three weeks. The summer was spent trying one thing and then another. Many trips out of Newport and around Block Island to give it real open ocean running. By early fall, we had the boat trimmed exactly where it needed to be and we were all set to go but the speed was only in the high 70's at this point. Before the cold winds of winter arrive, I ship the boat back to Florida and work begins on getting ready for the 1979 season. Step number one was a new engine builder. McBetts from Long Island, NY. He had built engines for Stan Pike a friend of mine that was national APBA champ the year before for the Sports Class. He never had an engine problem all year. You see, as the new kid in the Open Class, I knew that I would not get the best engines from Mercruiser. World Champs and better known personalities, somehow get the engines that tested better on the dyno and you worked your way up the line. I didn't have the time for that. So McBetts built me two 496 cu in engines, that used two 1050 carbs on each engine. My fuel burn was at 110 gallons per hour racing. This was when everyone else was using the fuel injection. I took a chance, because I saw what they did with small blocks the year before. Okay the speeds came up but it still needed a real tweak. Thanks to Lynn Lupo and Don Schwebs at LAKE X, the boat was transformed from a bridesmaid to a winner. When the boat left the LAKE on its trip west to California, it was ready. Full tanks at 580 gallons and running on fresh water.... the boat ran 89 MPH. I was ready to introduce myself to the Open Class at last. The Bushmills race as many of you know was sponsored by Bushmills Irish Whiskey and the race date in 1979 was St Patrick's Day. The wet pits were located at the Balboa Bay Club. Very nice club and a perfect place to hold this kind of race. The day before the race I had breakfast with John Crouse and he asked what I thought of the field. I said impressive for sure. Billy Martin, Betty Cook, Jerry Jacoby with Bobby Saccenti and Bill Elswick all just back from the December race in Argentina. Howard Arneson and Rocky Aoki with his new Keith Black hemi engines, in a Cougar Cat. Howard Quam with Keith Hazell on throttles. Bob Nordskog with the hometown advantage. Joel Halpern and Joey Ipolitto. Arnold Glass and Mel Riggs in Copper Kettle. Paul Clauser and Errol Lanier in Satisfaction. 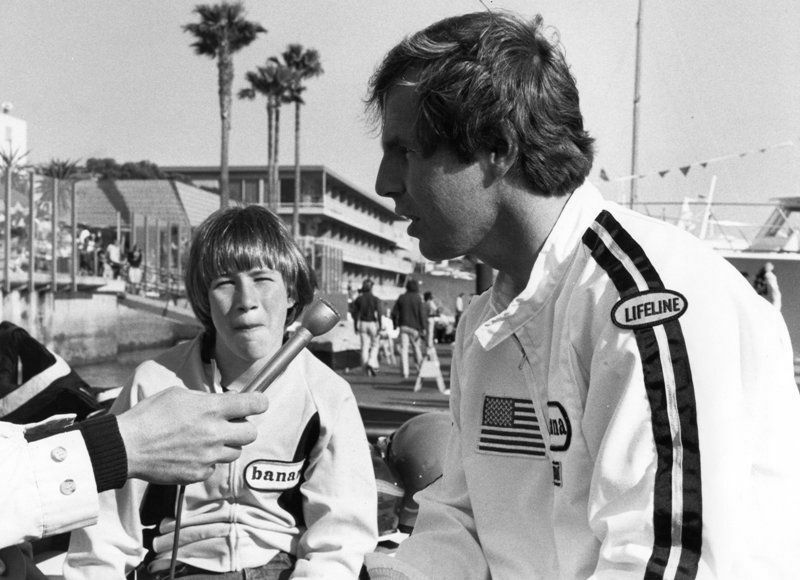 There was the smattering of west coast racers that seldom ventured east, but were always ready to take a first place on their ocean if you gave them a chance. Schiada being one of them. The craziest fans of the whole circuit live in Newport Beach. When the race boats left the harbor for the start, every boat in that harbor rode out with us. Big yachts and every kind of trawler you can imagine, wanted to be part of the trek out to the start line. Test day before the race was semi rough and we began to set the boat up one way, but the morning of the race when we flew the course in our helicopter, we changed our minds and went back to the original set up. Other boats were changing props right up to the roll out for the start. Back then there was no rule of how the boats should circle before the race and it was a time to keep your wits about you. It was very dangerous as some boats were rocking back and forth trying to get on plane with heavy fuel loads and others were stopped while the crew changed props. The roll out starts and I shoot right up next to the pace boat. This was always my favorite starting spot, as it allowed me to keep my props in clean water long after the start, as I would cut over in front of the pace boat and have a clear lane to just go. Betty was on my right, then Jacoby and then Elswick. On the other side of the pace boat was Nordskog then Howard Quam and Rocky, Halpern and Ipolitto with some west coast guys were in there too. The green flag waves and off we all go. The Pacific is tricky, as you think it is calmer than it really is. I was driving and throttling and trimming the boat. I had always done that and thought I could do it in Open class too. We take a couple of long leaps and I start trimming and the next thing I know Elswick pulls up and starts to pull ahead. I leave the trim and tap my mechanic Pauly, to take over the trimming. I get back on the sticks and we regain the lead and start moving out. My wife and my son are in our helicopter above me and off to one side filming us. I look up a couple of times but mainly focus on being in the lead. The first leg was down to Dana Point and we just kept getting further ahead of the pack. As we make the turn I can see that Jacoby, Cook and Elswick are the first boats behind us and we just keep moving. By now Pauly has also taken over the sticks and we work together on where to keep the speed. Jacoby makes a run at us and I just push the sticks up and we are gone. Each checkpoint we seem to be further ahead, every turn we just looked at each other and shrug our shoulders.....This is too easy, what the heck is going on? We won the race, Jacoby with Saccenti on the throttles in Ajac Hawk finished in second place just one minute behind us. Then one minute behind them for third was Betty and the KAAMA team. We go over and pick up the checkered flag and head back into the harbor. As we near the shoreline we see this guy waving for us to come closer and I turn the boat toward the dock some people are standing on. It was John Wayne, who wanted to give us his personal congratulations. A few months later he passed away. At the dock was a complete Blackwatch Bag Piper troupe playing Irish songs. Lots of photos and interviews and finally the whole crew gets tossed in the water to celebrate. After I changed and dried off there was a huge press conference in one of the rooms at the club. With about 125 reporters there, the first question I was asked was ....."How can a rookie to this Open Class racing, pull off such an upset victory, with so many experienced stars in the field?" I waited a for a few long seconds and said....."Well, I guess with the name of McCarthy, on St Patrick's day, I was the only one using the Leprechauns in the engine room, to pour shots of Bushmills into my carburetors." The press room just exploded into peals of laughter and the rep from Bushmills gave me a big thumbs up. It was a good day to be Irish, for sure. Later after the banquet and trophy presentation I was with Bill Elswick and mentioned that I was happy to win but it seemed too easy. He laughed and said he had the exact same thoughts when he moved up to Open class the previous year. You see, when we fought it out in the Production class boats, Bill and I ran in the modified class and with his 27 foot Magnum and my 24 foot Banana Boat, we raced in the exact same conditions that the Open class raced in. Less miles, but the same waves. He said the bigger boats don't run as hard as we did in the smaller boats. So with my new designed boat and new style engines, I leave the first race of the year with the points lead and get ready to go to Miami in two months and do it all over again. SOS: Wow, what an answer! Thank you Charlie. Part three to follow, Hope you've enjoyed the first two. Thank you for allowing me to rellve such great memories from that St Patrick's day so long ago. Erin go Bragh! Press interview later in the afternoon, with Charlie and his son Charley sitting on the boat. The awards banquet and presentation of trophies and plaques. 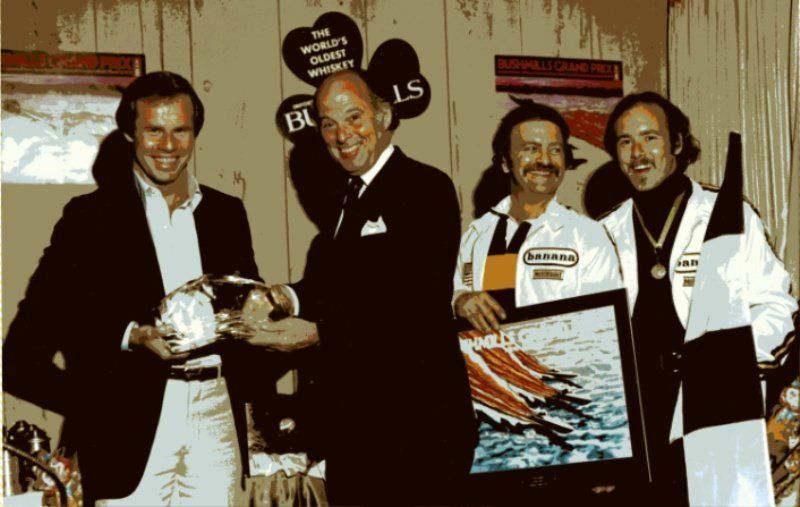 L to R: Charlie, award presenter, Ron Morrison his navigator, and Paul Lesnewski his mechanic / throttleman. This stuff is pure gold!